The heart of this hot rod BMW is its splendid inline 6 cylinder turbo motor. Tuned to produce 320hp and 330lb.-ft. of torque, this quintessential BMW straight six is a joy to trot, canter or gallop. Although the engine produces maximum torque as low as 1,300rpm, you will be reluctant to reign in the sweet six before the tachometer sweeps past 6,000rpm. It’s one of the freest revving engines I’ve ever driven, with an exceptional proclivity for high rpm operation. 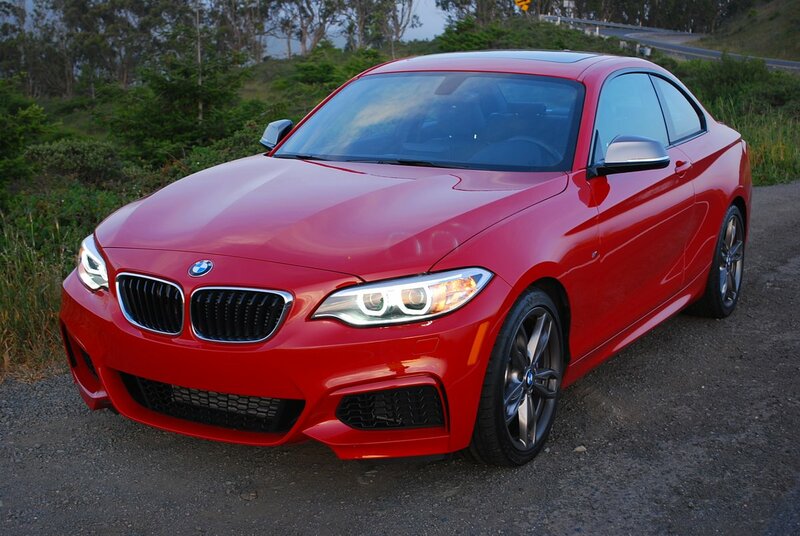 As a daily driver, the M235i passes the test with flying colors. It’s never temperamental, it has a sizeable trunk, and it will comfortably carry four adults should the need arise. Just park the gearbox in Drive, dial up the “Comfort” setting on the Driving Dynamics Control, and potter around town as if you were driving any conventional grocery getter. 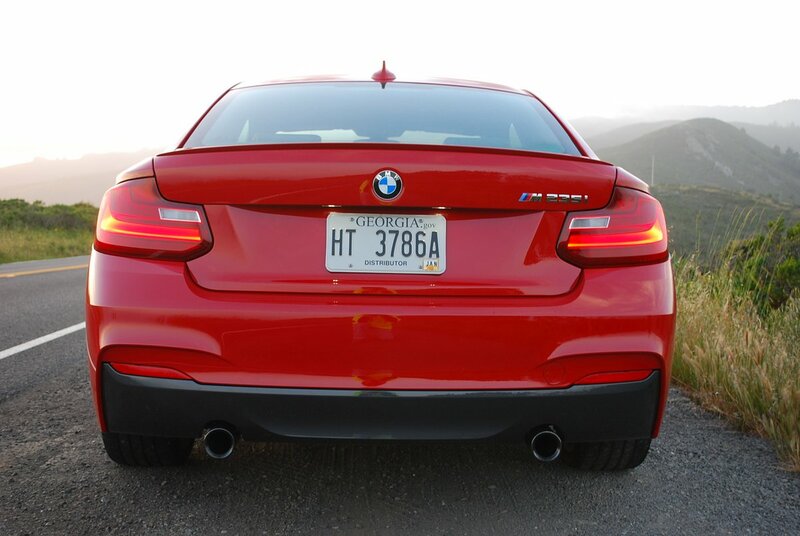 The M235i will make no demands of you whatsoever, in spite of its track bred pedigree. If a stretch of freeway cantering should arise, you might want to crank the mode dial into “Eco Pro” to maximize mileage (32 MPG Highway). Closet racers will select the track oriented “Sport+” specification when riding this bronco at full gallop. For most driving, the “Sport+” choice is ideal. It stiffens the suspension, quickens the variable sport steering, and enhances the exhaust note. 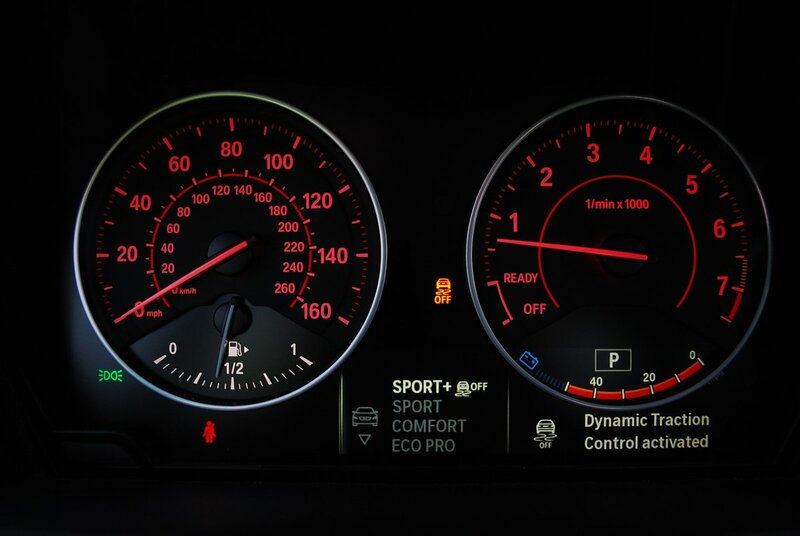 “Sport+” also replaces the car’s default setting of Dynamic Traction Control with Dynamic Stability Control, a sportier alternative which, as BMW points out, “allows the driver to handle several of the stabilization tasks.” It’s in this latter state of tune that the M235i really comes into its own. The gear ratio splits of the Sport Automatic transmission are optimally configured for maximum acceleration. With 8 gears on hand, each successive up shift keeps the 3.0 liter on full boil. Best of all, when you get to the heart of the batting order – second, third and fourth gears – you hardly lose 500rpm with each up change. You can climb into this diminutive coupe and instantly go fast. 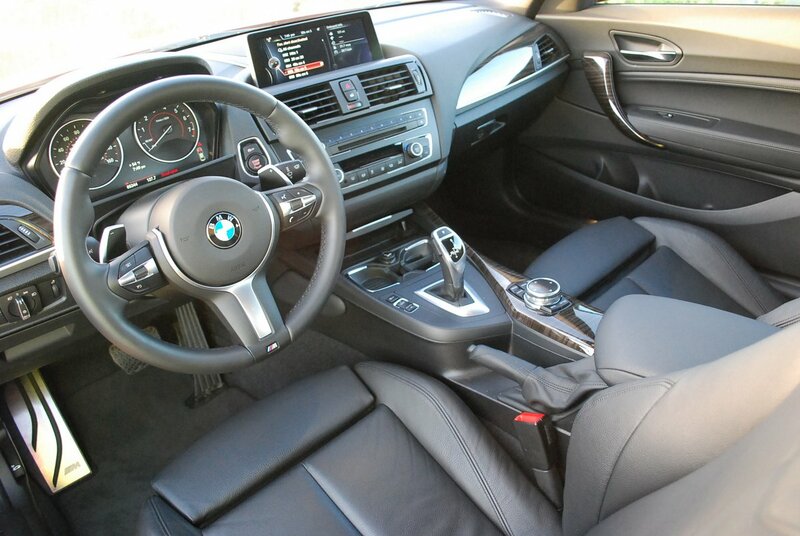 You really don’t have to fiddle with any of the Driving Dynamics controls BMW provides for optimization. The laws of physics infrequently overcome the inherent stability of this coupe, thanks to the beefy contact patches of its Michelin Pilot Super Sport tires (225/40 R18 front/245/35R18 rear). Stylistically, the M package is so discrete that uninformed onlookers will hardly note its existence. Wind management, for example, is so conservatively handled that the stubby tail spoiler looks like the Gurney flap for a wing that’s missing. Subtle flutes and creases channel air through the triple honeycombed front grill slots. Thanks to sharply angled, auto-leveling, Xenon adaptive headlights, surrounded by LED “Corona” rings, this BMW greets you with the inscrutable masked gaze of the Lone Ranger. Out back, the deftly sculpted under tray incorporates marker lights and blackened exhaust finishers so subdued you hardly notice the car has twin pipes. The only flamboyant visual flourish is the use of silver metallic paint on the exterior rear view mirrors. The indoor furnishings are equally buttoned down. Black on black is the byword here, with Black Dakota Leather sports seats held together by black stitching. The dash and door surfaces offer varying patterns of pebble grained black vinyl. Floor mats and carpeting are plush black velour, and even the fine wood trim inlays on the dash and door panels are striated ebony. 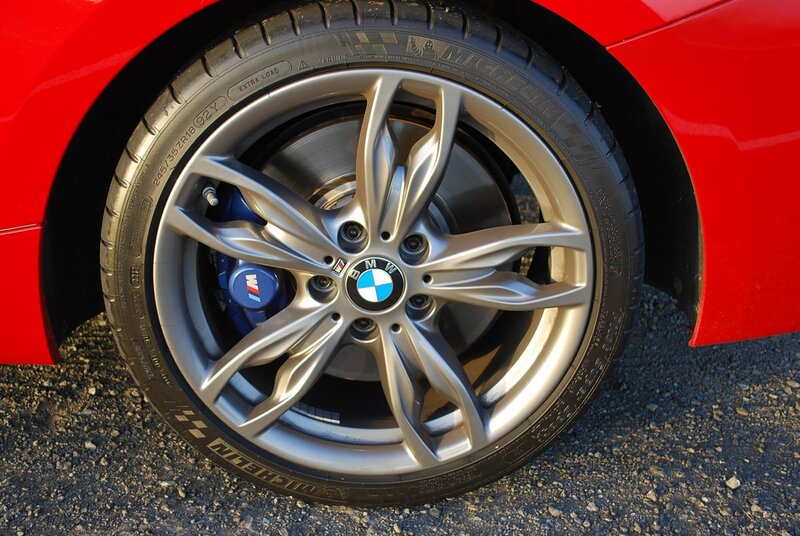 Only the oversize M Sport dead pedal and entry kick plates shine with aluminum luster. The power activated front seats are fully supportive without being confining. Depending on how much cornering resistance you need, you can notch the degree of pinch around your lower back electrically. The fat rimmed M Sport multi-function steering wheel provides a pair of protrusions designed to retain your thumbs at the proper 9 and 3 o’clock positions. Elongated alloy shift paddles feature rubberized edging for better control. BMW’s latest Bavarian hot rod is an autobahn assassin. It’s beauty lies in the fact that it has more faces than Mount Rushmore. It’s adept at trundling and bundling. For touring it’s alluring. And for shredding it’s abetting. Car as mood ring, sympathetic to every personality trait from melancholia to mania. This BMW has the full range covered. And at just $49,025, it’s way cheaper and more fun than a long term shrink.